Today is a beautiful day. Even if it’s cold, and gray, I think it’s a beautiful day. Let me break down why. 1) it’s Wednesday and Wednesdays are my favorite day of the week (no clue why, I’ve always loved them). 2) It’s the LAST day of the longest month of the year! I know. I know. January has 31 days like a few other months… but y’all, this month kind of felt never-ending. And now it’s all but over. Let’s take a moment to reflect: How are your goals going? Are you crushing them? Are you at a standstill? Do you need a little inspiration to get back to it? Well, I think I have you covered if you want some inspiration. I got the chance to interview a beautiful woman who inspires me daily. She’s insightful, caring, smart as a whip, has the sort of humor that makes your cheeks hurt from laughing so hard, a wonderful mother and wife, and she is currently on a health and wellness journey and has lost 100 pounds! And another reason today is great? 3)I’m committed to bringing Woman Crush Wednesday back. Remember when Woman Crush Wednesdays (#WCW) were a huge thing? If I could bring them back and make them current again I would because Sam is definitely a #WCW and I’m so glad she agreed to be interviewed to discuss her weight loss journey, life, and aspirations. If you follow me on instagram, you may have seen my super cheesy vegan mac and cheese and I know I said I would share it today. However, that was before I realized that today is the LAST day of this month. And a Wednesday. And I want to inspire you (and myself) to end the month on a high note and to start February with some gusto! I’ll share the recipe this tomorrow (Thursday). This is vastly different than my usual posts but I want to share the stories of real life day-to-day people that I am lucky to know who inspire and motivate me. People who make me strive to be better and I want to be a vessel to share their stories so that they may inspire you as well. Sam is the perfect person to kick start this series. She may have lost 100 lbs but that’s not the only thing that inspires me from her. Her consistency and transparency throughout her journey is something to be celebrated. She is honest, raw, and a light in this world. I hope you listen, learn something, truly hear her, and are inspired to continue your own 2018 goals or recommit to them. The interview is below. If you are interested in connecting with Sam, she invites you to follow her on instagram where she is active and encouraging of those seeking weight loss support and help. Enjoy and please let me know what you think! The amazing motivational goal weight cards Tyler made for Sam to open when she reached each milestone. Each card contained an unknown gift for Sam to ‘cash in’ on when she hit the number on the card. How amazing was that? Special thanks to Sam for agreeing to do this interview. Are you inspired? How is 2018 going? How can we move forward in February to reach our 2018 goals? Happy ending to the longest month ever! On Monday, I shared my new found mushroom obsession and promised a recipe using my favorite mushroom powders. If you missed why mushrooms are the bees knees, check this out now! Hopefully you are as excited about mushrooms as I am and eager to get more of the potent and nutrient dense fungi in your diet. But how? I know some people (like my mom) cannot eat mushrooms whatsoever. For her, the texture is too overwhelming. She literally gags when she eat them. Although I do not agree with her disdain for mushrooms, I get it; I wasn’t always the biggest fan (but I think a reason for that is because I wasn’t exposed to them as a kid) of mushrooms. So for the picky eater who doesn’t thrive off of mushrooms, I highly recommend mushroom powders. There are so many on the market and you really want to make sure the sourcing is legit. I recommend this brand and these two powders. So let’s say you have mushroom powders already… the question becomes, “how the heck can they be used? !” and the answer is beautiful: you can use them however you would like to use them. Add a teaspoon to your morning coffee, a smoothie or smoothie bowl, your oatmeal, your tea, your homemade bone broth, your favorite soups, and the list goes on. Seriously- in powder form, mushrooms are nearly undetectable. I am going to share my current two favorite ways to add mushrooms into my daily routine. This will include a way to get a mushroom fix in the morning and a way to get it the evening as well. I currently use reishi mushroom powder and lion’s mane mushroom powder. I use lion’s mane in the morning because it aids in mental clarity, boost memory and concentration, and improves brain health. I want to start my day in a positive and alert state and lion’s mane fit the bill. I take reishi at night because it has a calming effect on the mind and helps in getting a deeper sleep. I make super nutrient dense drinks with the powders and am ALL about it. This tea is a POWERHOUSE. It is jammed packed with goodies and superfoods. I have been drinking this for 3 weeks straight and swear by it. I have noticed a difference in my overall mood, concentration, and even mental drive. This recipe has more ingredients than I usually use in a single recipe BUT it also has so many nutrients that I don’t mind. Omit what you don’t want and enjoy what you do want in it. add molasses and hot water and stir. Enjoy warm and be prepared to get a boost of energy within 20 minutes of consumption. I love a warm soothing beverage in the evening before bed. This elixir is savory and comforting. I hope you enjoy it as much as I do! Mix dry ingredients in mug and add cashew milk and stir well (I like to use a frother here as well!) and then add in honey or molasses if vegan and hot water. Enjoy this perfect bedtime beverage warm. Now these beverages admittedly are not going to be winning any beauty contest but they are tasty and super beneficial to our overall health and well being. I hope you try one or both out and please let me know how you like them! Do you have any bedtime or morning ritual drinks or foods? Let me know in the comments! ***Please note that when I say scoop of something and not direct measurement I am referring to the scoop the product comes with and using that as a serving size. Last week, I talked about the cancer fighting purple potato and why I am all about incorporating more purple foods into my diet. This week I want to talk about fungus! Yes, fungus. I’m about to get super “hippie mojo” as my husband and brother-in-law call it when I start talking about medicinal mushrooms, but please be patient with me. Mushrooms are POWERFUL and if you are not already supplementing your diet with the almighty fungi, you may want to start. So why are mushrooms so powerful and why should you be eating them daily? And why am I all about eating fungus on the regular? Well, my mushroom obsession started a few months ago when I learned from the doctor that I was vitamin D deficient. And saying I was shocked is an understatement. I am in the sun daily. I garden. I go on long walks with my kids. I practice yoga on my deck. I am constantly in the sun. I have the melanin in my skin to prove it! I’m a shade darker than I have even been in my life because of all my outdoorsy, under the sun activities. It didn’t make any sense to me as to why I would be vitamin D deficient. And all my doctor said was to start taking a vitamin D pill. I was telling my mother-in-law about it and she started laughing. She explained to me she surprisingly has a surplus of vitamin D. Her lab work for vitamin D is considered excellent. Y’all… my MIL has very fair skin. She doesn’t tan. She shades herself every time she steps outside. She pretty much avoids the sun (and I must say, her wrinkle-less face shows how well she takes care of her skin). Before that conversation I was under the impression that we could only get vitamin D from the sun. And if that was the case, how could my MIL have more vitamin D than me?!? Turns out that some people, especially those who are fairer skin, absorb the sun more efficiently than those who are darker. All my melanin and pigmentation actually reduce vitamin D production in my skin. I started researching and learned that many people of color are vitamin D deficient and completely unaware. I can spend HOURS in the sun whereas someone lighter in skin tone can spend 15 minutes in the sun and they may absorb more vitamin D than I have, despite the quantity difference. After learning I couldn’t win with the vitamin D fight, I decided to follow my doctors orders and get some vitamin D pills. However, I’m always on the search for adding more value to my diet and life as naturally as possible, so I started down the research rabbit hole and stumbled on medicinal mushrooms. I learned that mushrooms are the only food we can get vitamin D from and instantly became intrigued. I read more and more and then, well, I started eating more mushrooms. I scouted Saint Louis and Springfield for medicinal mushroom powders and elixirs. I started adding mushroom powders to my smoothies. I started making mushroom tea. I’m probably going to turn into a mushroom soon. But before I turn into a mushroom, I want to share the benefits of mushrooms and a few ways to add their healing powers to your diet. When we think of antioxidants, we often think of foods bright in hue like blueberries, purple potatoes, red peppers and other vibrant colored foods. However, crimini and portobello mushrooms have the same amount of oxygen radical absorbance capacity as red peppers. High levels of selenium lowers the risk of bladder cancer and several types of mushrooms are rich in this mineral. Mushrooms are the sole food we can get vitamin D from. Mushrooms produce vitamin D when exposed to sunlight like humans do. Three ounces of D- enhanced mushrooms can provide 400 IU of vitamin D! Mushrooms are a great source of dietary fiber. Mushrooms provide insoluble chitin and soluble beta glucans. Insoluble fiber is important for proper digestion and soluble fiber can slow the rise in your body’s blood sugars after a meal, and can help control your blood pressure and cholesterol. Mushrooms promote the maturation of bone marrow dendritic cells which may help enhance the body’s immunity leading to better defense systems against invading microbes. Mushrooms contain loads of vitamin B2 (riboflavin) and vitamin B3 (niacin). B vitamins are vital for turning carbohydrates into glucose, which the body burns to produce energy. Vitamin B also helps the body metabolize fats and protein. Many varieties of mushrooms have upwards to 44 percent of the daily recommended amount. Mushrooms have been used for hundreds of years as medicine in many Asian cultures. There are at least 270 species of mushroom that are known to have various therapeutic properties. I just recently started adding medicinal mushrooms to my diet and honestly there is no going back. I currently use two mushroom extract powders: reishi mushroom and lion’s mane mushroom. I start my day with lion’s mane and end my day with reishi. This is the Lion’s Mane I use. I had to order it from Amazon because I could not find a single store that sold it near me in powder form. 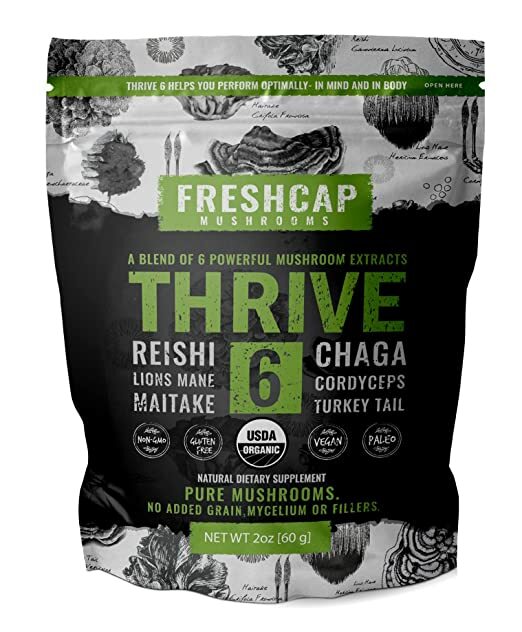 I found the Reishi powder in stores but if you cannot find it near you, I recommend this one based on reviews and I like this brands other products a lot! Lion’s mane is good for brain health, memory boosting and aids in concentration. Reishi is good for calming the mind, relaxing the body, and aids in deeper sleep. I have been using these powders for a little over a month and really enjoy them. I even take them with me when I travel. 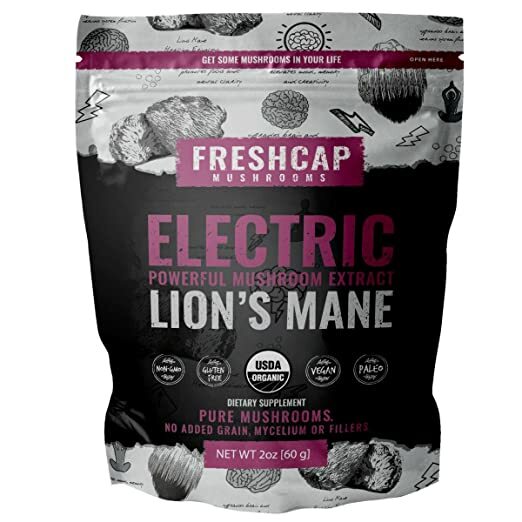 I highly recommend trying these and other mushrooms. If you do not like to eat mushrooms for whatever reason, I recommend investing in the powders and adding the powders to smoothies, shakes, teas and so on. Getting creative and having fun with fungi has been an enlightening experience. I look forward to adding more mushroom varieties into my diet. This Wednesday, I’ll be sharing my favorite memory boosting morning tea and my go to calm nights elixir. I have been drinking these for a 3 weeks straight and LOVE it. Be on the look out- you won’t want to miss it. They are a powerhouse of nutrition! How do you feel about mushrooms? Was this convincing enough to add more to your diet? I am excited to share a new vibrant recipe today involving shrimp, a beautiful smokey sauce, sauteed spinach, a heap of fresh veggies, and a sweet pineapple treat. This meal has color, flavor, and it’s delicious. I’m even more excited to share this recipe in collaboration with my friend Samira who is the creative genius behind RedefinedWorth.com. We decided to do a collaboration using Asian inspired sauces in our own unique way. Originally we were going to try to use the same sauce but my local grocers didn’t carry the garlic and green onion sauce she was using because doesn’t it look YUM! I was pretty bummed about it. I improvised and found this Mongolian sauce infused with garlic by P.F. Chang’s. And it is GOOD. I mean, “I want a third serving” kind of good. This sauce gets a gold star. It is so good I ended up using it twice in the same day in two different meals. So yeah, it’s a winner. I still want to try the sauce Samira used because H-E-L-L-O have you seen the salmon she made with it? I plan to recreate that recipe as soon as I get my hands on that sauce and I highly suggest you do the same! After you’re done checking out my recipe, make your way to Redefinedworth.com and look at the delicious food and positive affirmations being created over there. You won’t be disappointed! Samira has a light she’s sharing with the world and I always feel uplifted and positive after viewing her blog or Instagram page. She’s on a spiritually healing journey and I am thankful she is sharing her insight and wisdom as she learns and heals. I’m also pretty stoked she was down to collaborate. I truly believe that you should surround yourself with people who inspire you and Samira inspires me. Visit her blog to get inspired too. If you’re visiting from Redefinedworth.com, welcome! I hope you like what you see and will stay awhile. I share food, yoga videos, and tips to get healthy weekly. Since I used P.F. Chang’s Mongolian sauce and took some of the stress away from creating my own sauce, I decided I wanted to make this recipe as quick as I could. I used precooked shrimp (I told my husband to get shrimp from the store. He came back with precooked shrimp. I’ve never used it before but it was actually pretty dang good. I was impressed with it and if I’m ever in a time crunch, I would buy it again) to save even more time. I wanted a lunch that took very little time yet looked impressive. I believe this fit the bill. To save even more time, you could use pre-cut veggies, canned pineapple, and microwaveable rice. Cooking the rice took the longest with this recipe, so if you use microwaveable rice you could have a complete meal ready in less than 5 minutes! Now time for the recipe! Cook rice according to package instructions (I use a rice cooker. Perfect rice in 20 minutes every.single.time.) and while that’s cooking, allow shrimp to marinade in 1/2 cup P.F. Chang’s Mongolian sauce (at least 10 minutes, ideally at least an hour before you want to assemble your bowl). Sautee spinach in remaining 2 tablespoons of the P.F. Chang’s Mongolian sauce for 2-3 minutes on medium heat covered. Remove from heat once wilted. Once rice is cooked, split rice between two bowls and then divide everything on the ingredient list on top of the rice. Note: These toppings are suggestive. You can get as creative as you would like and top with an assortment of goodies, such as, lettuce, radish, cucumber, mango, and so on. If you decide to use precooked shrimp like I did, you can quickly warm the shrimp in a pan over the stove for about a minute (any longer could make the shrimp rubbery). If you want to keep this vegetarian you could sub the shrimp for tofu, tempeh, or cooked veggies! Let me know if you plan on making this quick and super satisfying meal and how you like it as well as any tweaks you’ll make to it. I think next time I make it, I’ll use tempeh instead of shrimp just to give it a different take. Now time for Samira’s mouthwatering salmon recipe. Y’all I wish I had this in front of me right NOW because it looks hot fire flames (aka beautiful and delicious)! First things First:Clean your Salmon! Once done, remove from heat and place to the side while you prepare your sides. See, Easy is the way to go yall! This Salmon was flavorful and moist with a little crisp to it that was to LIVEEEEEEEEEEEEEE for!!! I couldn’t stop taste testing it before snapping the pictures lol So if you don’t have this Teriyaki sauce in your cabinet, WHAT ARE YOU WAITING FOR???!! Purple. Purple walls. Purple clothes. Purple jewelry. Purple everything! As you may have heard, purple is the color of 2018 according to Pantone and I am HERE for it. I love purple. We painted our girls bedroom a light shade of purple and I feel calm when I enter it- even with a million toys, books, puzzle pieces, and clothes thrown around. I am here for all things purple. If purple is the color of 2018, than I figure, why not eat the color purple as much as possible as well? It has been proven that darker foods contain a richer antioxidant level. Antioxidants keep free radicals at bay. Purple pigmented foods also contain flavonoids, including resveratrol, which can help decrease blood pressure by relaxing the arterial walls and decreasing the pressure in the arteries which allows for better circulation. Resveratrol has also been shown to kill cancer cells. Purple produce contains polyphenols which can reduce the inflammation. So if 2018 is the year of purple, I am all for eating purple foods. Besides for being a powerhouse in nutrition, purple food is just plan pretty. I mean look at this deep hue. And this vibrant color was found in nature. The purple sweet potato gets it’s deep purple hue from the antioxidant, anthocyanin. I present to you a nutrient dense smoothie bowl. A smoothie bowl that is purple thanks to PURPLE SWEET POTATOES. Yes. Sweet potatoes. No food coloring. Just good old fashion earth grown sweet potatoes. Extra plus? This smoothie bowl is perfect for those with diabetes because it has a low glycemic index and helps stabilze blood sugar levels. Many smoothie bowls require a heavy use of fruits (which I love) but this smoothie bowl is a little more savory. If you want to make it sweeter, add more banana or agave. My daughters loved this smoothie bowl concoction and couldn’t get enough of it. I ended up having to make another! My two year old thought it was so cool to be eating ‘papul’ (how she says purple) food. I also love that it requires only 4 ingredients! I hope you make this smoothie bowl soon. It’s delicious and one that will be in heavy rotation this year and beyond. All hail 2018: the year purple got it’s spot in the light! *your topics of choice : I used goji berries, coconut flakes, bee pollen, and cacao nibs. Wash and remove skin of purple sweet potatoes. Cut into even cubes and boil until fork tender, about 10 minutes. Remove from heat and place in cold water to stop the potatoes from further cooking. Once completely cooled, place in a bag and freeze. You now have frozen purple sweet potatoes ready to use for smoothies or smoothie bowls. Place 1 cup purple sweet potato, banana, cashew milk and sweetener of your choice in a high speed blender and blend until smooth and thick. Serve in a bowl and top with your favorite toppings (fresh fruits and super foods like cacao nibs are perfect here). Enjoy! I am excited that 2018 is the year of purple. There are so many purple foods I want to experiment with and am feeling pretty inspired. How do you plan to eat more purple things this year?